V2 - same sound - smaller box! 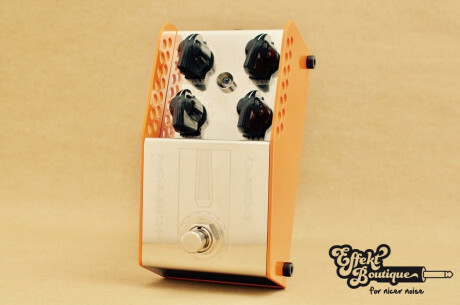 MUFF style pedal that would work with a variety of guitars (Humbucker and singlecoil's including P90's) and amps and be bombproof so it could be gigged. The FALLOUT CLOUD Fuzz V2 - same sound - smaller box! I was asked to create the MUFFROOM CLOUD by a number of vintage pedal enthusiasts I know. They were after a MUFF style pedal that would work with a variety of guitars (Humbucker and singlecoil's including P90's) and amps and be bombproof so it could be gigged. The brief was simple, make a Muff Style Fuzz that could beat their original 1971 Triangle Muff pedals when placed head to head. The brief was simple, the task was not, however after many prototypes and a bit of lateral thinking the MUFFROOM CLOUD was born. This pedal has the ability to beat any Muff you have heard (including the best vintage units). By adjusting the perfectly voiced EQ you can achieve fuzz tones from silky smooth through to doom laden whilst maintain the ability to cut through.